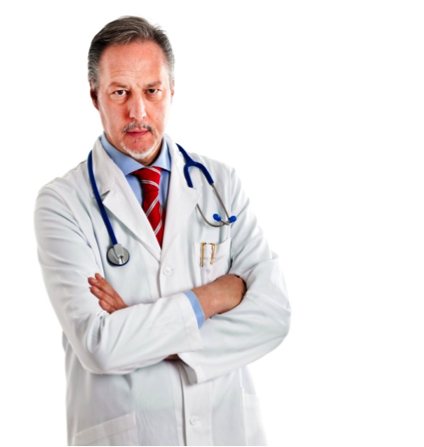 What do the supporters of medicines regulation for e-cigs say, and why are they wrong? It’s quite hard to actually find a coherent case for regulating e-cigarettes as medicines. Mostly those making the case show it can be done, but do not show it is the best thing to do or compare it to lower cost, lighter touch alternatives – see the MHRA work on nicotine. But the essence of good policy making is options appraisal, not simply justifying the only thing you know about. I have already said quite a bit about the problems of medicines regulations: see 10 reasons not to regulate e-cigarettes as medicines and medicines regulation: when caution can kill, and a briefing on the legal aspects: are e-cigarettes medicines? But I thought it might be useful to examine the arguments used by those claiming regulation of e-cigarettes is the only way to go one at a time. Short response: already covered in the legislation that keeps thousands of products safe. Products on the European market already have to be acceptably safe under the General Product Safety Directive and the related framework of legislation, which also allows for product or sector-specific standards (eg. cigarette lighters). There are other regulations covering electrical safety, containment and labelling of hazardous substances and various aspects of commercial practice. It is also possible to establish specific European Standards (CEN) with a safety objective should these be needed. This broad framework keeps European citizens safe from thousands of potentially dangerous products (eg. things using mains electricity, hazardous chemicals like bleach or drain cleaner, things with sharp edges or moving parts etc etc). The primary safety purpose of medicines regulation, however, relates to the safety of the drug itself – ie. to unwanted side-effects or drug interactions arising from the potent chemicals in medicines (such as Varenicline). There is no concern about the active ingredient nicotine given how widely it is used. EU legislation is required to use the least burdensome regulation possible to meet the policy objective, and this is it. If vendors want the added hallmark of high safety that comes with a marketing authorisation as a medicine, then they should be free to go through that process. For others, there should be a satisfactory ‘floor standard’ consistent with the general safety obligations. Short response: quality is driven by primarily consumer choice and suppliers competing. Faulty products and/or dangerous products are covered in consumer protection legisaltion. Yes, but only up to a point. For most products, the market determines the range of products, prices and spectrum of quality – by ‘the market’ I mean the evolutionary pressures of consumer preferences, supplier innovation, product quality and price – meaning the bad products fall by the way side. Some aspects of quality are a subset of safety and these are covered by the provisions above. It is also possible to set European Standards for quality if needed. If something simply doesn’t work as advertised or claimed, then the product is faulty, and covered by the Sale of consumer goods directive 99/44/EC. A list of applicable legislation, already in force, is available at: E-cigarettes are unregulated, right? (wrong). Those favouring medicines regulation have never shown why these directives, applied purposefully and properly enforced, would not provide a good balance of consumer protection and commercial freedom – especially important where the growth of the market is what gives the public health return. Yet under the treaty (Art 5 TEU Protocol 2), and for sound policy reasons, EU regulators must use the least burdensome regulation available. If vendors want the added hallmark of quality that comes with a marketing authorisation as a medicine, then they should be free to do that, but it should not be a requirement unless there is no alternative. Short response: no they don’t. NRT treats nicotine withdrawal. E-cigarettes provide an alternative way to take recreational nicotine. This argument goes that e-cigs do the same job as NRT – to quit, to cut down or for dealing with when smoking is banned – so should be regulated in the same way. This couldn’t be more wrong and is a source of great confusion amongst health campaigners – users of e-cigarettes, however, are universally clear on the difference. NRT predominantly is used as an aid to manage nicotine withdrawal symptoms during an attempt to stop smoking and nicotine use completely, though has been used ‘off license’ for nicotine maintenance (this has changed only recently). E-cigarettes are not used therapeutically, but as an alternative to smoking and a different way to use nicotine. E-cig users are looking to recreate or improve on the pleasures they experience from nicotine use and smoking, but without the negatives – smell, anti-social aspects and cost may be as important as serious distant health risks – and a sense of fun or connoisseurship. We can call this ‘harm reduction’ from a public health perspective (and be mighty pleased about it in my case) and many users celebrate the health gains they achieve. But the user’s purpose is primarily seeking experience of using a benign recreational drug… see Are e-cigarettes medicines? for the legal destruction of this supposed equivalence. These are not medicines any more than caffeine, alcohol or tobacco. There are many things that improve health that are not medicines. More excellent analysis on this by Carl V Phillips Tobacco harm reduction: it’s not just about harm reduction and Chris Snowdon Taking the pleasure out of e-cigarettes. Much mischief follows from this misunderstanding. Short response: only if a vendor is claiming some ‘effect’ – otherwise consumers decide if these products work for them – the normal way with almost all products. This confusion arises from the misclassification of e-cigs as medicines by flawed analogy with NRT, as discussed above. If the product is simply a recreational product about which no claim has been made, it is not the job of the regulator to come in and invent some sort of enjoyment or satisfaction standard that these products must attain. That is a matter for consumer preference and the functioning of the internal market – not least because regulators don’t know what consumers want from the experience, don’t know how their preferences will evolve etc etc. If a health claim is made, then the product should be evaluated as a medicine, but this should not be a requirement where no claim is made. Short response: to have maximum reach e-cigs need to be as widely available as cigarettes and in equivalent settings – not just sterile pharmacies. One of the most serious issues about medicines regulation is the restrictions on availability imposed on licensed medicinal products: in many countries these are ‘pharmacy-only’. It is typical of the British only to think of themselves – some medications can be sold on general sales in Britain. But the proposal favoured by many British campaigners would cause huge problems elsewhere, where all licensed medicines are ‘pharmacy only’. It is important that e-cigs are not only as widely available as cigarettes, but also in the same type of settings – bars, tabacs, newsagents, supermarkets, filling stations etc. Again the NRT-equivalence fallacy is the problem. E-cigs are not medicines, and do not generally appeal to users as medicines – so it would be disadvantageous to sell them in sterile medicalised settings. Short response: that’s their problem and a reason not to take their advice or fund them – lawmakers are serving citizens not interest groups. It is true that the public health community has more than its fair share of professional zealots, prohibitionists and authoritarians – and that these are also overrepresented in the WHO (see this appalling case if you need convincing that the WHO should be ignored and funding withdrawn). However, it is the job of policy-makers to evaluate evidence and do the right thing for citizens, not to be intimidated or mislead by elements of the public health community. There is no need for the EU to accept counter-productive policy on e-cigarettes handed down by WHO through the FCTC. The EU has a vote, the FCTC looks for consensus. It would be better for the EU to make a compelling case for a market driven approach underpinned by light touch consumer regulation. It would be better to stop funding WHO to provide dangerous misinformation. Short response: regulatory costs should always be as low as possible, but fixed regulatory costs reduce diversity, innovation and so limit appeal. The starting point for deciding any regulatory approach in the internal market is not whether producers can manage costs of excessive regulation or, more usually, to pass them on to consumers, but what is the lowest regulatory cost consistent with meeting the objectives. So arguments that ‘big companies can afford it’ should be dismissed as answering the wrong question. In fact, the estimated cost of the the licensing process given by the UK MHRA is not trivial: up to £2,280,000 (present value) or £266,000/year annualised – see its Impact Assessment (note £1.0 = €1.16). And this doesn’t cover additional costs associated with upgrading the supply chain to pharmaceutical clean-room standards or the lost revenue costs during the lengthy approval process. These costs may be bearable for vendors of high volume commodity e-cigs. But costs and approval processes like this have impacts: (1) on diversity and niche products – ie they work against having a ‘long tail’ of differentiated products that each appeal to a small number of consumers, because each product needs an authorisation. (2) They also work against an ‘experimental’ approach to innovation – try lots of products and see what proves popular. This is common with fast-moving consumer goods, but not the model of innovation that applies in the pharmaceutical industry. (3) There’s also a ‘chilling effect’ on innovation from restrictions the regulator would apply and the developers’ perception of how those restrictions might apply, given the cost of being wrong: eg. would they try to get approval for pina-colada or tequila flavour? Short response: this is needlessly expensive and difficult given most nicotine is delivered in cigarette smoke. Medicines regulation requires these products to be made to an onerous and expensive ‘Good Manufacturing Practice‘ standard. Given that 98% of nicotine is consumed through a filth-laden matrix of micro particles of burning tobacco and hot toxic gases, it’s hard to justify going to the other extreme – especially as this will disrupt the supply chain currently supporting the market and add great cost. Yes, it is a ingrained habit of the EU to punish entrepreneurs and small businesses with life-sapping demands, but there really is no need in this case. As with other costs, it needs to be justified as proportionate and non-discriminatory. This standard doesn’t apply to foods, alcohol etc and cosmetics use a ‘lite’ standard for GMP using ISO 22716. In international law (WTO-Technical Barriers to Trade), measures must not be more trade restricting than necessary to meet policy objectives – and the preference is always for performance specifications rather than regulating design or manufacturing unless needed – so that would mean setting a purity standard for an e-liquid for example. It’s basically overkill to apply this standard – and therefore not compatible with the EU Treaties. UK campaigners and the UK regulator the MHRA have been at pains to stress how ‘light-touch’ or ‘right-touch’ their approach would be – how open they would be to ‘lifestyle’ marketing etc. It remains to be seen how this will work out in practice in the UK. It probably won’t be fatal, but I suspect they’ll manage to impede progress, diversity and innovation, raise costs and introduce a bland tone to the category that will make it less appealing to smokers – moderate harm, a few thousand needless deaths. But that’s just the UK. The bigger problem is that campaigners and regulators in other countries are not so progressive – but this is EU law and the EU will establish a powerful precedent internationally. Medicines regulation hands very considerable obstructive powers to a regulator- at the expense of the commercial freedoms that are the crucial ingredient in gaining widespread uptake. Regulators should not have that power, unless the risks (or possible benefits) justify it. In other countries the regulators are much more hostile and the campaigners creating the climate in which they make decisions are also much more hostile – a good example is the the Australian regulator who is egged on by some very hostile campaigners and prone to political interference. No we don’t. We don’t require tobacco, alcohol, caffeine, salt, motorcycle, sporting gun, condom, cycle helmet [insert potentially risky industry here] to conduct this sort of pro-active market surveillance. Whilst concerns about children using the products when they shouldn’t what would it mean for the vendor. Questions of ‘dual use’ (use with continued smoking) or non-smokers taking up the products are interesting, but that’s all. They are primarily an academic concern, albeit interesting, and adults have freedom to do these things if they want to, even if health campaigners disapprove. Risk management systems in medicines regulation have the primary function of detecting adverse side effects, interactions with other drugs or ‘contra-indications’. Again, normal standards of producer responsibility should apply. If we think that more than that is necessary, the kind of approach used in cosmetics regulation would be better. Short response: VAT concessions are redistributive – someone is paying more tax somewhere else. These products are consumer products and should not be provided with tax breaks or through public spending (ie. on prescription) other than in exceptional cases. Smokers existing spend on cigs should be the primary funding source, and lower costs and no excise duties should allow for savings to the individual. The idea that lower VAT compensates for the higher underlying costs of regulation reflects a misunderstanding of the public finances. Taxes are transfers, regulation actually consumes extra resources. Lower VAT revenues just mean taxes come from somewhere else creating a different cost to the consumer/taxpayer. It isn’t a real net saving, though it would have distributional consequences. Again, not every country has the same VAT treatment of pharmaceuticals [EU rates] – for example it is 19% in Germany. It’s important not to misunderstand what the VAT break means in the UK and not to generalise this to countries where it doesn’t apply. Medicines regulation would involve pre-authorisation of several aspects of marketing, branding and advertising by the regulator, and they are sure to be risk averse and reduce creativity and ‘edge’. Let us be clear, the big health gains come from as many people switching as possible from smoking – and that is a marketing challenge, in marketeers should be as unfettered as possible. The risks arising from aggressive advertising are negligible – but the upside is potentially huge. The public health challenge has two main dimensions: first, ensuring products that are good enough are available and driven to be better by fierce competition, not protected by regulatory barriers to entry. Second, maximum uptake by smokers driven by effective marketing and a regulatory framework that doesn’t render the products boring and unappealing. It is not in the public health interest to create sterile safe products, marketed in a worthy but dull way. Even alcohol – with far more harmful unwanted side effects than e-cigs – does not have a pre-authorisation regime. However, it is not unrestrained either – see Advertising Standards Authority Guidance guidance. Why not something like this? By the way, the risk to children from e-cigs is negligible – teenage experimentation is inevitable and any prolonged uptake is more likely to be an alternative to smoking (a beneficial early diversion from the much more damaging habit) so excessive weight should not be placed on this risk compared to the public health imperative to persuade adult smokers to switch. See: we need to talk about the children: the gateway effect examined. It is certainly true that the warnings proposed for nicotine containing products are unhelpful: “This product contains nicotine and can damage your health” it says in the Commission proposal. Useless communication basically, given that the only interesting risk information about these products is the comparison with smoking. So it might be argued that medicines regulation could do a better job. The trouble is the NRT products inspire no confidence in that respect: here is the Patient Information Leaflet for a Nicorette Inhaler. 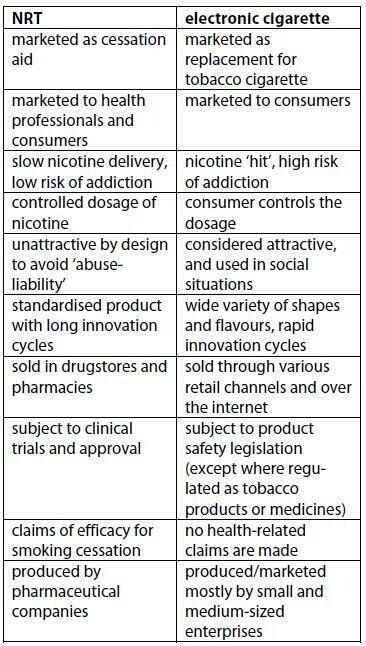 The excellent European Parliament library briefing on e-cigarettes highlighted the difference in a table. There is no final text yet as ENVI has decided to get the voted draft scutinized in jurisdictial view. While this is reason to hope that the outcome will look more like what JURI supplied I find this way of policy making very strange. It will also leads to the final ENVI proposal to the parliament being available just-in-time for the vote. There will be no time to really read or analyse it. MEP Renate Sommer has issued a complaint about procedure that was delayed by MEP Groote to after the summer break. Groote and McAvan seem to have carefully timed all this to avoid consultation and discussion. Has this been superseded, and if yes, do you have a link to the new text? Thank yoU! That was the original proposal. The draft maintains the same levels of nicotine in tobacco as the previous directive. Which is 1mg per cigarette. Now, there is a grey area for those tobacco products which are not cigarettes. I know that a lot of companies want to regulate e-cigarettes as tobacco products. Legally it may be the best option, ethically and scientifically i think it is not. It is yet another issue showing that when public health is becoming the subject of law science alone and not medical science, a lot of stupid decisions and paradoxical legislation will be made. Scientifically, e-cigarettes are a tobacco product in the same way as biodiesel is a vegetable product. JTI ploom is classifed here as pipe tobacco here in USA (not as a cigarette) — I thought the EU draft directives actually was based on drug regulation (2 mg per catomizer limitation echoes the standard-base level 2 mg nicotine gum) but I don’t know the drafting history. The final proposal is to regulate all e-cigarettes as medications. There is no nicotine limit set…. That is one of the BIG mistakes of the MEPs! 1 ml Liquid is NOT equal to 1 Tobaccocigarette! 0.1 ml Liquid is approx. equal to 1 Tobaccocigarette! For this reason the (formerly) intended restriction to 2mg/1ml was absolute nonsense! Compared to 0.1 ml… Maybe! There will be an outcome of 20mg Nicotine per 1 ml Liquid if they had regulated the restriction to 2mg per 0.1 ml Liquid. And if you consider that absorption is less than exposure, then the comparative amount of liquid is even less…. The cheapest and easiest way to get nicotine is to get it from chemical factories. It is sold for 400-600 euros per kilogram, meaning that you can get as much nicotine with 1 euro as you get from 100 cigarette packs. There would be no cheaper drug ever available in the world. But, have you seen anyone using nicotine by itself? Heroin addicts want to use pure heroin, cocaine addicts want to use pure cocaine, but nicotine addicts do not want to use pure nicotine. They want to use something that has behavioral, sensory and motor stimulation. Something that produces smoke or vapor. It is completely different. Dr. Farsalinos you are obviously very knowledgeable here — more than mysef. Do you agree that the draft Directive nicotine levels do not apply to a tobacco product, and might that be a way around them? Nota bene: the draft tobacco directive on e-cigarettes is directed to “non-tobacco products.” I think a fair reading of the draft statute would suggest that products like the Ploom are exempt from the nicotine limits contained therein BY VIRTUE OF BEING TOBACCO PRODUCTS. This might be a more effective way to traverse nicotine limits in vaporizers that would apply should the Directive take effect as drafted. In addition to ploom, another example would be the Discreet e-cigarette sold here in the States. Ploom & Discreet and products like them maintain the traditional tobacco-drug distinction. I think you ignore one obvious, reasonable argument and that is that pharmaceutical grade nicotine has been regulated as a drug for decades. From this vantage point, the e-cig is an unregulated, recreationally marketed drug product. It seems at least rationale to me that regulators would want to retain drug control over drugs. We would not let a marketer sell “recreational” diazepam. Seems to me the industry needs to focus more on tobacco-based vapor products, like the JTI ploom. This is completely wrong. Diazepam and related drugs need special prescription to be obtained. Nicotine is available over the counter. No Dr. it is not “completely wrong” thank you. Nicotrol nicotine inhaler is an Rx in many markets (otc in UK). But let’s talk about OTC medicines — they require drug submissions, cgmp’s etc. Why should you be able to sell nicotine without comparable data/quality control? It’s a reasonable argument — that you may not find persuasive. The point of my comment was simply this is a reasonable argument to consider. How about “recreational” OTC cough syrups sold in trendy bottles for the young people that enjoy abusing them? I could say that is preferable to abusing other drugs — I kind of harm reduction as it were. My point is simply that regulatory classifications are — by their very nature — formalistic as opposed to directly-polocy driven, and there is a traditional division as between tobacco and pharmaceutical grade nicotine that has existed for nearly as long as modern drug regulation itself. Comparing current diazepam status with current nicotine status is wrong because they are now regulated differently. It is not a matter of not accepting or respecting a different opinion, it is a matter that this is not happening now. Concerning the opinion that nicotine should be regulated as medication, of course i respect that but i disagree. Nicotine is not used as medication in e-cigarettes, it is used for recreation. E-cigarettes may be successful only because they provide pleasure, not because they act like medications (in fact, nicotine has failed when used as medication). There are numbers of reasons why they cannot work in any other way besides recreation. Thus, why a substance that is not working like a medication in e-cigarette should be regulated as one? The reason the try to do it is not because of the nicotine itself, it is because they have no other way of getting e-cigarettes into their hands. Of course regulation should be implemented, and quality products should be available. But not by using the medicinal regulation. It is inappropriate, disproportionate and will kill the potential of e-cigarette to reduce smoking prevalence. I understand your position and it is grounded in good arguments — with to my mind one exception. I don’t think you can argue that the absence of therapeutic indication allows you to de-drug classify a compound that’s been understood to be a drug forever. I think that’s a tough position — that clearly cannot apply to other drugs. So, we need to make the harm reduction argument that tobacco/nicotine is special. Part of the historical problem is that e-cig makers have wanted to avoid taxation so they ‘ve RUN FROM TOBACCO CLASSIFICATION. I think they should have (and should) do the opposite — embrace tobacco classification. As I’ve noted, I think this will get these products around the low nicotine levels of the draft directive that will kill the category (which I don’t advocate). Indeed Dr my diazepam example was a bit provocative so I take some responsibilty there! I understand your argument about nicotine considered as a drug. But, why is it caffeine not considered a drug? As a Brit myself living in Germany, I would like to stress that GB has a National Health System, i.e. the State pays for medical treatment. They thus have a vested interest in improving the health of smokers. At the same time, the tax on cigarettes is higher than in most of Europe. The british government thus stands to gain on two counts by being lenient towards e-cigs. In Germany, for example, where people have to pay health insurance themselves (in fact it is mandatory unless you are privately insured), the picture is entirely different and they thus tend to favour the W.H.O. approach of banning anything that is dangerous….even if it not as dangerous as they believe. In the wake of the ENVI Commission’s decision this week, I have highlighted 4 counterarguments for treating regulating e-cigarettes as medicines. We have spend 18 months developing ESTEEM Premium Electronic Cigarettes, which are naturally of a premium standard and quality. Yet we argue that the biggest casualty of the proposed legislation would be passive smokers. ENVI has voted – They regulated every ecig (regardless of nicotine threshold) to be an medicinal prodcut (not medical product!!) iaw Directive 2001/83/EC. At the ENVI workshop, one of the participants summarily dismissed the idea of allowing the GPSD to apply to e-cigarettes for the sole reason: “That it is inhaled, and the GPSD applies to washing machines and refrigerators” (I paraphrase). Of course, it’s a specious argument that medicinal regs would alter anything in this regard, since long-term health data would still need to be acquired regardless of the regulatory framework! Elements of food or cosmetics regulation may be a better model for the longer term, or some product-specific decisions under consumer legislation. My view is that they need to design something fit for purpose based on what the product is, whilst recognising that most nicotine is inhaled and consumed in toxic smoke. That could come later – with proper application and enforcement of consumer regulation doing the job now. The Commission did a very poor job in assessing appropriate regulatory models. The quick way to knock down that objection is to point to Articke 17 of the directive – novel tobacco products can be placed on the market at will, subject to a notification requirement. So if your low risk nicotine product needs rapid access to the market, just make sure it contains tobacco… Unless of course it is snus, in which case it is banned. I agree with Art 17, by the way. Maybe the BBC have finally got the message – quite a good report with some nice quotes, worth a read! You mention ‘the British only thinking of themselves’ – one area which could usefully be examined is the indication for period of use of NRT in non-UK states(assuming ecigs would have to conform to the same medicines rules as NRT). Would other regulators insist that the ‘therapy’ lasts no more a year? One reason for concern is that the UK regulator has had more liberal indications for NRT than most other countries. That of course means other countries have been more restrictive – exactly the dangers here. Clive Bates has prepared another very good and informative text. I would like to comment on the Good Manufacturing Practice part. I believe that there should be some kind of standards in e-cigarette manufacturing. This applies mostly on liquids, which invloves handling of chemicals (which can be dangerous sometimes, e.g. handling of high concentrations of nicotine) and availability of ingredients at different purity grade. Of course, i don;t believe that pharma GMP standards are appropriate. However, it is possible and financially feasible to make specific GMP standards for the e-cigarette industry that are realistic and will not exclude the small businesses. Such an effort is made by AEMSA* in the US, and i believe that such e-cigarette focused regulations will promote both consumer safety and regulatory requests. *I am not advertising anything when i refer to AEMSA. It an officially registered non-profit association (501(c) status by the IRS), founded and ran by consumers with no financial associations with the e-cigarette industry. The work on a voluntary, non-paid basis. The same applies for my involvement. I agree about realistic GMP standards for nicotine products. This has been done with cosmetics which has evolved a standard: ISO 22716. This didn’t happen overnight and involved in depth discussion with the affected industry. That sounds like what AEMESA is working on… Given that most nicotine is consumed through toxic tobacco smoke, it would be better to take time to get a standard right and proportionate, than to impose something that effectively destroys the existing supply chain, without any consultation or proper assessment of impacts. Right on the mark again! That “annualizing” of the licensing fee is just another example of number abuse. This kind of calucalation may be applicable for Big Pharma or Big Tobacco who can afford to spend that much money up front and can reasonably expect the product to generate revenues for the next 10 years. With e-cigs the “life span” of a product – where it can be sold – is currently just months, not years until some better design comes along and the previously successful product is replaced on the market by something better. So, when you really want to “annualize” here you got to multiply the number by 3 or 4 instead of dividing by 10. And with duration of the process those product are totally obsolete by the time they are “approved”. Just look at the one currently in the process in the UK. When the application was filed this e-cig rather a rather mediocre design to begin with. Meanwhile it’s totally outdated. BAT has no chance to sell enough to get even a small percentage of the cost back. At least if the current market isn’t totally squashed by regulation. I think the “high risk of addiction” part needs some closer scientific scrutiny. Quite a few studies show that there are more factors to addiction than just the nicotine. There is just one piece in this objective briefing that leaves a sour taste. The map and the table in the annex are rather misleading. The picture it paints seems to show that most countries in the EU already consider e-cigs a medical product. But you have to look at the fine print. It says that a country ist classified this way if there is any NCP – not just e-cigs! – that is considered a medicine. And what does “considered” mean? Well, there are some offeicial zealots in germany who consider it. But those that tried to force this issue got slapped down in court. But still, we are paraded as “considering”.